“Mousse” is the French word for “froth” or “foam”. The dish was so named because of its light and airy texture. Such texture is achieved due to tiny air bubbles from whipped cream or whipped egg whites that are carefully folded in. Mousse is usually flavored with chocolate, puréed fruit, or vanilla. There also are savory mousses that can be made with fish, liver, avocado, and other ingredients. 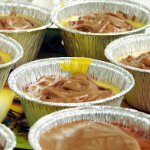 Various types of mousse can be found on the menu of many restaurants and coffee shops, so you can celebrate the National Mousse Day by going out with your family, friends, or significant other. You can also make tasty mousse yourself using the following recipe. Melt 8 ounces semisweet chocolate in a bain-marie. Add 3 tbs powdered sugar, 3 tbs cocoa or strong brewed coffee, and 3 egg yolks (one at a time). Stir until mixture has thickened. Remove mixture from heat and let it slightly cool. Whip 1 1/4 cups cream, add to chocolate mixture. Scoop mousse into serving dishes and let it cool in the fridge until set.